I’ve always admired the pretty acai bowls on offer at cafes and it’s often my go-to when I’m out for breakfast on weekends. But I wanted to learn how to make these vibrant bowls of goodness in the comfort of my own home. I personally believe that acai bowls can be enjoyed at any time of the year – I have no hesitation eating ice cream in the middle of winter, for instance. Native to Brazil, Trinidad and northern parts of South America, acai (pronounced a-sah-ee) is a small, round, purple berry that grows on the acai palm. The vibrant purple colour of acai means that it’s rich in antioxidants, as well as polyphenols and anthocyanins (a flavonoid pigment that is also found in blueberries, blackberries and beetroots). Thanks to its incredible health benefits, acai is considered a superfood. 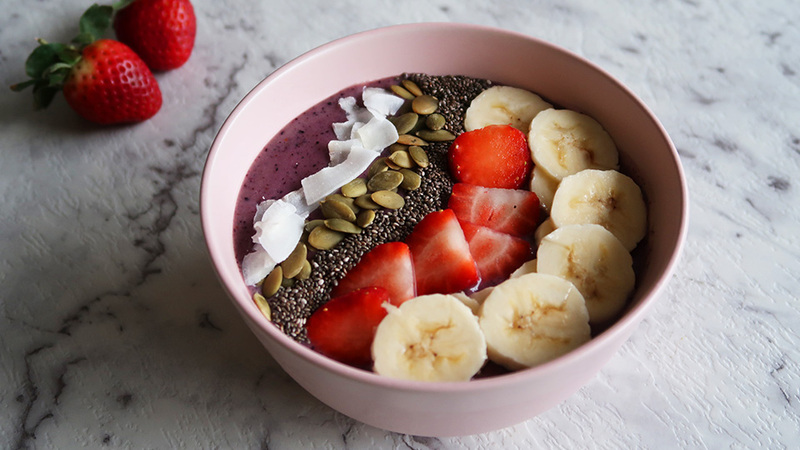 This acai bowl is so easy to whip up, tastes delicious and makes it really easy to pack in plenty of vitamins. There’s also no added sugar, making this a sweet treat you don’t have to feel guilty about enjoying. Place all ingredients for the acai mixture into a high-powered blender and blend for about a minute. When the mixture comes together, it should be thick in consistency – similar to soft serve. Halve the acai mixture between two bowls. Smooth the mixture with the back of a spoon to make a flat surface to layer your toppings. Adding the toppings is the fun part, and you really can do what you like here. Finely slice the banana and strawberries and arrange in a line across the bowl. Sprinkle on chia seeds, pumpkin seeds and flaked coconut to make a brightly coloured bowl. Enjoy for breakfast, dessert or as a snack. Whether you’re vegan, lactose intolerant or simply looking to try a dairy alternative, almond milk is a winner. Get the recipe here. Love the combination of chocolate and peanut butter? Then you’ll love this pudding. And it’s not as naughty as it looks.